The future is looking bright for 1,900 middle school students in Catawba County. Thanks to a $2,000 Bright Ideas education grant from EnergyUnited, seventh graders at all three public school systems in the county will learn about the energy that powers their world through a new, innovative program. 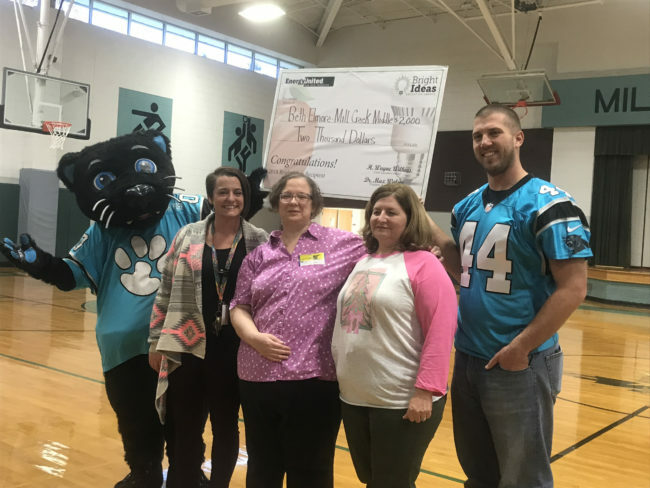 Teachers Chasity Bolch (left), Vanessa Lail (center) and Beth Elmore (right) pose with Sir Purr and player J.J. Jansen. 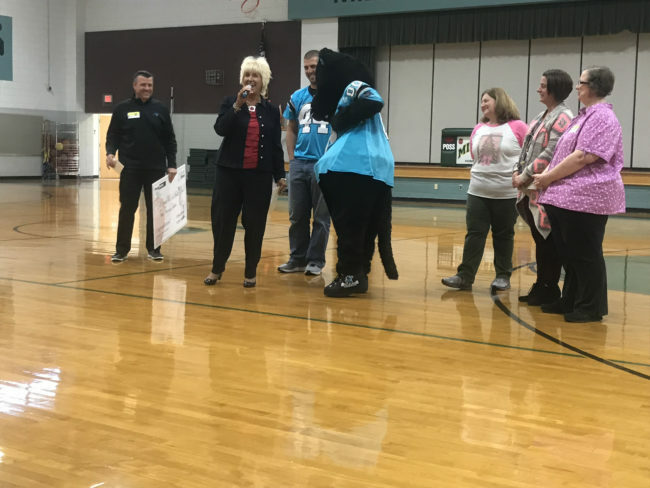 J.J. Jansen, long snapper with the Carolina Panthers, joined Sir Purr and officials from EnergyUnited at Mill Creek Middle School this week for an assembly to congratulate seventh grade teacher Beth Elmore and students on winning the grant for their “Watts Up” project. The celebration also recognized Chasity Bolch with Newton-Conover Middle School and Vanessa Lail with Grandview Middle School for their partnership on this project. Maureen Moore of EnergyUnited emcees the event with the help of Sir Purr. Through this county-wide project, students will build models of power grid landscapes, giving them a hands-on opportunity to learn the ins and outs of how electricity works, while developing basic skills used in the Science, Technology, Engineering and Math (STEM) fields. The grant will go toward the purchase of kits to build the models, which will be shared across approximately 48 seventh grade science classes at eight schools in the county. This collaborative project is a unique partnership between EnergyUnited, Catawba County Schools, Newton-Conover City Schools and Hickory Public Schools. The kits will also be made available upon request to students being home schooled. 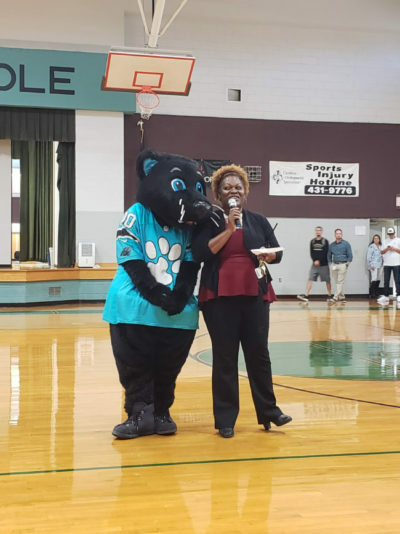 Sir Purr entertains the crowd by befriending Ms. Ijames, principal of Mill Creek Middle School. The Bright Ideas education grant program, sponsored by North Carolina’s Electric Cooperatives, has helped improve education by awarding funding to K-12 teachers for innovative, classroom-based projects that would not otherwise be funded. Since it was created it 1994, the program has awarded more than $11.5 million for more than 11,000 projects, touching the lives of more than 2.2 million students statewide. Across the state, North Carolina’s electric cooperatives have awarded approximately $600,000 this month to North Carolina educators to fund about 600 projects.